Surrey police took an interest and provided me and my family with additional security. On 29th November 2009, I received a report from West Yorkshire Police to advise that they had identified and visited an individual and asked him to desist writing defamatory material about me and remove from his website material of that nature. I was asked to contact them if I became aware of further articles by the same individual “causing you harassment”. Despite the fact that at the time I did not know the name of the author, he subsequently went public and then accused me of using the police to suppress free speech on the internet. To maximize the embarrassment, the complaint was published on their website the same day it was delivered to my Bishop, so that I and many others were aware of it before he was. A year later in October 2013, the complaint was resolved by conciliation.I believe this was due in part to the robust support I received from several Jewish academics and rabbis, from leading politicians and several Anglican Bishops who spoke in my defence and challenged the allegations.Although the Board of Deputies withdrew their complaint on this occasion, the criticisms continued and eventually led to my early retirement, but that is another story. Being accused of antisemitism is not something I would wish on anyone. It is painful and when such allegations are publicised, it is acutely embarrassing as well as distressing to family and friends. The word “Antisemitism” came into use in the late nineteenth century to describe pseudo-scientific racial discrimination against Jews. Now, it generally describes all forms of discrimination, prejudice or hostility towards Jews throughout history; and has been called “the Longest Hatred”. “Denying the Jewish people their right to self-determination, e.g., by claiming that the existence of a State of Israel is a racist endeavour. Leading lawyers have described the new IHRA definition as having a “chilling effect” on free speech. Hugh Tomlinson QC was asked to give legal opinion on the impact the new definition could have on freedom of expression and assembly, by Jews for Justice for Palestinians (JfJfP), Independent Jewish Voices (IJV), Free Speech on Israel (FSOI) and the Palestine Solidarity Campaign (PSC). Tomlinson insisted that the new definition could “not be used to judge criticism of Israel to be antisemitic, unless the criticism actually expresses hatred towards Jews.” Criticism of Israel for its actions is clearly not synonymous with criticism of Israel for being Jewish. Designating Israel as a Jewish state is also problematic, not just for two million Israeli Palestinians, but also the five million Palestinians living under military occupation in the Palestinian Territories. 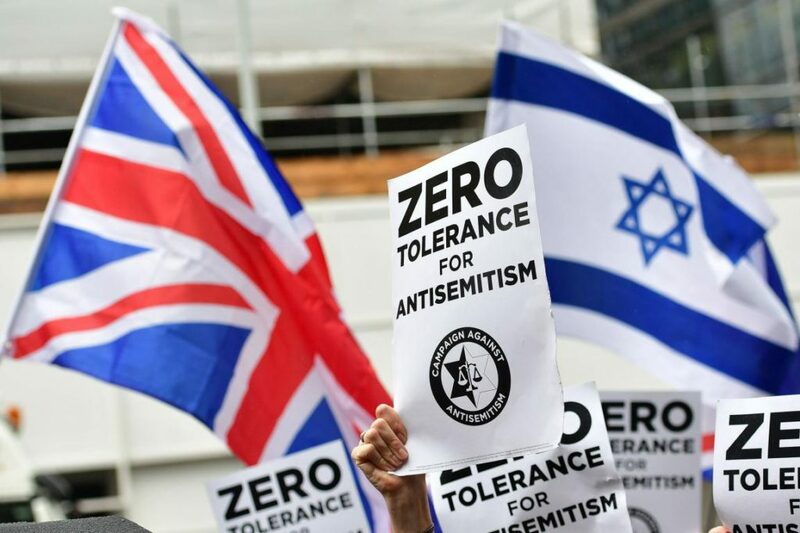 Jewish activists have been among the most vociferous in voicing opposition to the new definition.Ben White cites several anti-Zionist Jewish campaigners. Frances Webber, of the Institute for Race Relations, raises a more fundamental concern that antisemitism is now being seen as not just about racist actions but also about prejudicial attitudes. In effect, he argues, the IHRA definition operates within the realm of ‘thought policing’. “… what particularly concerns us here is the way that the definition of anti-Semitism is moving from deed to thought, from the objective to the subjective, from action to attitude. The IRR has always maintained that it was important to distinguish between prejudices – the subjective – and the acting out of those prejudices – the objective – in discriminatory acts, physical attacks, government edicts etc. Penalising people for racist feelings or attitudes leads to thought-policing, whereas racist acts are measurable and therefore prosecutable before the law if needs be. And there are specific laws relating to incitement to race hatred, the committing of racially-motivated crimes, discrimination in provision of goods and services whether direct or indirect. Referring to the IHRA definition adopted by the Conservative government, Webber emphasizes that causing offence is not synonymous with racism. Lerman goes further, arguing that perversely, the new definition actually provokes antisemitism. “The de-coupling of the understanding of antisemitism from traditional antisemitic tropes, which thereby made criticism of Israel in and of itself antisemitic, necessarily made the opposite – support for Israel – into a touchstone for expressing sympathy with Jews. This opened the door to the phenomenon of Jewish support for far right, anti-Islam, anti-immigrant parties keen to whitewash their pasts and sanitise their anti-Muslim prejudice by expressing support for Israel and seeing the country and its Jews as the front line against Islam’s ‘incursion into Europe’. The children’s story of Chicken Little who thought the sky was falling in when a leaf fell on her tail is pertinent.By broadening or diluting the definition of antisemitism, people may become complacent or immune to genuine antisemitism and not repudiate it as they should. In the UK, Jeremy Corbyn and the Labour Party have been criticised for failing to address antisemitism within the party. Pro-Israeli lobbyists know that a Labour government under Jeremy Corbyn will introduce major changes to British foreign policy. Assuming Labour had a sufficient majority, Jeremy Corbyn’s government would likely recognise the state of Palestine on the 1967 borders, (like most of the rest of the world), and also might introduce sanctions against Israel as well as companies profiting from the occupation. It is lamentably true that in the past, church leaders have indeed tolerated antisemitism and incited racist attacks on Jewish people. Racism is without excuse. Antisemitism must be repudiated unequivocally.However, anti-Zionism is not synonymous with antisemitism. Judaism is a religious faith. Israel is a largely secular and multi-ethnic nation state. Zionism is a political system. These three are not synonymous. Indeed most Zionists are Christiansand many Jews are anti-Zionist. This is why it is imperative to repudiate antisemitism, to defend Israel’s right to exist, within internationally recognised borders, while at the same time campaign equally for the civil, religious and political rights of Palestinians to be respected. This is surely the best way to bring an end to the evil of antisemitism. The Palestinian Return Centre has obtained an Opinion from Geoffrey Robertson QC on the interpretation and impact on free speech, of the British Government’s acceptance in 2016 of an extended definition of anti-Semitism promulgated by the International Holocaust Remembrance Alliance (IHRA). See On Antisemitism: Solidarity and the Struggle for Justice: Jewish Voice for Peace, Haymarket Books, 2017.